Coupon for August: summerheat10 (expires 9/1/2011). Insert the code during checkout for 10% off their entire order! great story out of the state of florida! Andrew Schaer isn't comfortable with how young people are going about compiling their music libraries. He doesn't appreciate the growing population of young adults who are satisfied with listening to music on their laptops or cheap headphones. In his opinion, music deserves better treatment than that. In his store, right next to his cash register, Schaer has a small sign. There's a picture of an iPod, and the striking, bold font underneath reads, "This IS NOT a music collection." To the right of the iPod, there is a picture of a few bookcases crammed from top to bottom with vinyl records. The striking, bold font next to that picture reads, "This IS a music collection." Six months ago, the one-time Beach Boys frontman and country singer par excellence was told he had Alzheimer’s. Now he talks exclusively about his music and his memories. In November 2003, Glen Campbell drove his BMW into another car in Phoenix, Arizona. He then left the scene of the incident and was later picked up at home by Arizona police. Smelling alcohol on his breath, they arrested him and took him to Maricopa County jail. There, Campbell kneed a sergeant in the thigh, which led to an additional charge of aggravated assault on a police officer. He was convicted of extreme DUI (driving under the influence) and sentenced to 10 days in prison; his police mugshot was made public and became a widely viewed internet sensation. Legendary singer/songwriter David Crosby, an iconic troubadour of American music, who (somewhat amazingly) turns 70 on Aug. 14, has been sharing his songs via a varied configuration of bands for decades now. Of course he's most famous for his work with Crosby, Stills & Nash (and sometimes Young). As part of that legendary collective, Crosby helped define an era while demonstrating how to compose memorable, timeless music. A Sonny Clark Blue Note LP tops the list this week, getting a pretty good price at the top end of its selling range. The Psych holy grail LP by Leaf Hound sells for a bargain at about $1k less than its top price. A pulled U2 45 from Peru gets the #3 spot, and two more 45's round out the list. The Spades record was the first 45 released by Roky Erickson. The Bill Davenport 45 is a rare local rockabilly record out of Virginia. Grammy winner, Everlast to release new album, “Songs of the Ungrateful Living,” on October 18th. Album to be released on artist’s own label Martyr Inc. records, in partnership with EMI Music. First single, “I Get By,” set to impact modern rock radio on August 23rd. Erik “EVERLAST” Schrody is set to release his first album in three years, “Songs of the Ungrateful Living” on October 18th on his own Martyr Inc. Records. This will be the first release on the label, in partnership with EMI Music. Full of Schrody’s trademark gritty style, the album is awash in the beats and blues that have made EVERLAST a Grammy winner, a chart-topper, an Emmy nominee and a musical trailblazer for multiple generations. The first single, “I Get By,” set to impact Modern Rock radio on August 23rd is an anthem for our troubled times. Sings EVERLAST, “I voted for change and it’s kind of strange that’s all I’ve got in my pocket.” EVERLAST is not afraid to address the issues facing the world today, both political and personal. “Little Miss America” looks at the state of fame, reality TV and our country. “Little Miss America,” he asks, “where’d you get that scar?” On “Long Time” the big issues become more personal, documenting the struggles that are familiar to everyone. "The music industry has changed tremendously over the years," explains EVERLAST. “This album is particularly important to me to help express the current chaotic human condition we’re all dealing with. With this in mind I made the decision to take control of the situation and start my own label. ‘Songs of the Ungrateful Living’ is the first album on Martyr Inc. Records in partnership with EMI. Musically and lyrically, this album reflects the diverse musical explorations and personal ebb and flow that I have experienced in recent years." “We couldn’t be more excited to be in business with EVERLAST. His music has been an anthem for millions of fans and ‘Songs of the Ungrateful Living,’ is sure not to disappoint,” remarked Michael Harris EVP/General Manager EMI Global Label Services/Caroline Distribution. In 2000 Everlast penned the song “Put Your Lights On” won a Best Rock Performance by a Duo or Group With Vocal Grammy for his collaboration with Carlos Santana, “Put Your Lights On.” More recently, Everlast was recruited by Nancy Miller, creator and executive producer for the TNT series “Saving Grace,” starring Holly Hunter, to create the show’s theme song, for which EVERLAST was nominated for an EMMY. EVERLAST is also a member of the rap super group La Coka Nostra who have received major accolades and recognition as one of today’s hottest hip hop groups. Among the many artists with whom he’s collaborated are Willie Nelson, Snoop Dog, Madonna, Cypress Hill, Cee-Lo, Billy Gibbons, Swollen Members, Dilated Peoples, Run DMC, Kurupt, Limp Bizkit, X-Ecutioners, , Prince Paul, Daz Dillinger and KRS-One. MASTERWORKS BROADWAY proudly announces the release of Godspell - The 40th Anniversary Celebration, a two-disc set that will be available physically and digitally on September 6, 2011. The newly remastered collection includes both the original off-Broadway cast recording from 1971 and the motion picture soundtrack from 1973. Featuring new liner notes by composer Stephen Schwartz, Godspell - The 40th Anniversary Celebration comes out in advance of the first ever Broadway revival, which begins performances at New York City's Circle in the Square Theatre in October. The score by Stephen Schwartz, the Grammy® and Academy Award®-winning composer of Wicked and Pippin, includes the hit "Day By Day," which reached #13 on the Billboard Pop Singles chart in the summer of 1972. "The popularity of the record helped make the show a bigger hit," recalls Schwartz in his liner notes, "and at one point there were ten companies playing simultaneously around the United States, plus other productions in London, Paris, Australia, South Africa, Germany, etc…Today it is hard to believe that forty years have gone by since the original production." New Godspell interview and performance videos featuring Stephen Schwartz will be available for viewing exclusively on MasterworksBroadway.com. The 2-disc set also includes the soundtrack from the 1973 movie, which was filmed and set in New York City, and memorably featured the musical number "All For the Best" performed on the top of the as-yet-to-be-completed World Trade Center. Godspell introduced a young Victor Garber (Sweeney Todd on Broadway and four-time Emmy® nominee for TV's Alias) as Jesus and features the joyous song "Beautiful City" which was newly written for the film. Although this immensely successful musical based on the Gospel of St. Matthew now needs little introduction, when Godspell was first produced in 1971, it broke new ground in its treatment of the historical Jesus. It relates the last days of Jesus using dramatized versions of several parables, but quickly becomes something more – a religious experience and a joyous celebration of the family of man. Godspell opened at the Cherry Lane Theatre on May 17, 1971 and then moved to the larger Promenade Theater in August 1971, where it became one of the longest-running off-Broadway musicals of all time. Godspell moved to Broadway in June 1976 and was Tony®-nominated for its score before ending its run in September 1977, with a combined total of more than 2,600 performances. This beloved musical has become a staple of the theatrical repertoire in schools, churches, and community and professional theatres across the globe and is one of the most licensed titles annually. Masterworks Broadway is an imprint of Sony Masterworks. For email updates and information please visit www.MasterworksBroadway.com. The relationship between Berry Gordy's Motown label and The Ed Sullivan Show made music and television history. Soon after the Supremes' debut on Sullivan (December 1964), it was clear that showcasing the latest Motown releases on CBS on Sunday nights (35 million viewers was average) was a way to expose the record company's newest hits and boost the show's ratings. Sullivan introduced nearly all the Motown acts including The Supremes, The Temptations, Stevie Wonder, Four Tops, Smokey Robinson & The Miracles, Marvin Gaye, Gladys Knight & The Pips and The Jackson 5. From Hitsville U.S.A. in Detroit by way of The Ed Sullivan Show, these classic performances brought the "Motown Sound" to living rooms across America. Universal Music Enterprises (UMe) and SOFA Entertainment present Motown Gold from The Ed Sullivan Show (2 DVDs), and, in celebration of The Temptations and Supremes 50th Anniversary, The Best of The Temptations on The Ed Sullivan Show (1 DVD) and The Best of The Supremes on The Ed Sullivan Show (1 DVD). All three collections released on September 13, 2011 are packed with classic Motown performances from The Ed Sullivan Show, taped live between 1964 and 1971, and are fully restored with never before released footage. Motown performances on Sullivan were followed by a Monday morning sales spike and it was a perfect formula for mutual success. Berry Gordy's dynamic sound aimed to appeal to America's white teenagers and with the Sullivan stage as the entry point for his incredible roster of talent, this show business marriage remained rock solid until the show went off the air. Ed Sullivan and his producer, Bob Precht, were especially proud of the history these two iconic American institutions forged together. One great Motown group after another was introduced on Sullivan, new releases topped the music charts and Ed's brief chats with the artists all led to a greater acceptance of African-American R&B by white teenagers. This helped Motown to conquer America, and in time, the company became world renown as "The Sound of Young America." •The Jackson 5 ushering in a new generation of Motown acts with a medley of their No. 1 hits "I Want You Back," "The Love You Save" and "ABC." •Diana Ross and The Supremes performing their No. 1 hits "Come See About Me," "Someday We'll Be Together" and "Love Child." •The Temptations doing their No. 1 hits "Just My Imagination (Running Away With Me)" and "I Can't Get Next to You." •The Four Tops with their No. 1 hit single "Reach Out I'll Be There." •Martha & the Vandellas singing their timeless classic "Dancing in the Street." •Marvin Gaye's only Sullivan appearance singing "Take This Heart of Mine." •Young Stevie Wonder captivating the audience with his No. 1 hit "Fingertips Pt. 2" and his classic "For Once in My Life." •A never-before-released performance of Smokey Robinson & The Miracles singing a medley of the hits "I Second That Emotion," "If You Can Want" and "Going to a Go-Go." •And many other great Motown Performances! Bonus material included in this collection features a special performance by Gladys Knight & The Pips of "I Heard It Through the Grapevine" at the Brooke Army Medical Center in Houston, Texas, and the Four Tops singing ''Put A Little Love in Your Heart" at Walter Reed Army Medical Center in Washington, D.C.
Andrew and Josh Solt, whose company, SOFA Entertainment, owns "The Ed Sullivan Show" library made the following statement about the Motown collection. "We are so pleased that after working on this project for many years, the definitive Motown on Ed Sullivan collection is now available to millions of fans who love the Motown sound. The Sullivan show featured more Motown artists than any other television show and now these timeless live performances can finally be enjoyed by fans of what many believe is the greatest music of the 60's. A considerable amount of work has gone into making sure the sound and picture quality on the discs is optimal. We hope people will be dancing in the streets and in their living rooms when they push play on the Motown on Ed Sullivan DVD collection." The Supremes rose from poverty to become Motown's most consistent hit-maker and the most popular female group of the 60's. Along with the charmed circle of Motown singers, writers, producers and players, they rewrote the book on pop music, sang their way into the hearts of millions and made a lasting impression that continues to this day. With a total of sixteen appearances on The Ed Sullivan Show, The Best Of The Supremes collects some of the group's greatest performances. Included in this DVD is their very first appearance on The Ed Sullivan Show in December 1964, showcasing their No. 1 hit "Come See About Me." Other timeless performances featured are "You Can't Hurry Love," "My World is Empty Without You," "Baby Love," "Stop! In The Name of Love" and "The Happening." And, for the first time on DVD, this collection includes a full version of "Up the Ladder to the Roof" which is the only appearance by the "New Supremes" after Diana Ross went on to pursue a solo career. This collection of performances truly showcases why The Supremes are one of Motown's biggest and most beloved acts. The Temptations began their musical life in Detroit in the early sixties. With their flashy suits, distinctive harmonies and precise, split-second choreography, they popularized a refined style of performance that made them a household name. For the first time on DVD, you get the best of their Ed Sullivan Show performances. Included in this collection is the group's very first appearance in May 1967, in which they performed a medley of hits including "My Girl" and "(I Know) I'm Losing You." Other songs featured are the group's No. 1 hit "I Can't Get Next to You," a playful version of "You've Made Me So Very Happy," the Top Ten hit "Psychedelic Shack," and the 1969 hit single "Runaway Child, Running Wild" with Dennis Edwards replacing David Ruffin. •The Temptations' special appearance alongside The Supremes with each group performing a medley of the other group's hits, including "Get Ready," "Stop! In The Name Of Love," and "Baby Love." •DVD debuting performances by The Temptations of "Hello Young Lovers," "Autumn Leaves," and never-before-released medleys of "Girl (Why You Wanna Make Me Blue)," "All I Need," "Ain't No Mountain High Enough," "I'll Be There" and "My Sweet Lord." •The Temptations' last appearance on The Ed Sullivan Show in 1971 in which they performed "Get Ready" and their No. 1 hit "Just My Imagination (Running Away With Me)." These tender and soulful performances were a fitting farewell to The Ed Sullivan Show. Today, The Temptations and The Supremes continue to be an essential component of the Motown legacy. The Temptations recent DVD release, Get Ready: Definitive Performances 1965-1972, is currently double platinum, and their recent ICON CD has already sold more than 100,000 copies. The Supremes DVD release, Reflections - Definitive Performances 1964-1969 is also now double platinum. Fifty years later, original fans as well as new fans confirm with steady sales that these performers' true artistry and talent is timeless. Vinyl’s growing popularity is more than just spin. Last year, 2.8 million records were sold, making the old-fashioned LP the fastest-growing music format in the United States. In 1939, 'The Wizard of Oz' premiered in Hollywood, CA. Judy Garland became famous for the movie's song "Somewhere Over the Rainbow." In 1955, Elvis Presley attended a meeting in Memphis with his manager Bob Neal, Colonel Tom Parker and Vernon Presley, at which a new contract was signed that names Colonel Parker as "special advisor" with control of virtually every aspect of Elvis' career. Parker was not really a Colonel at all, but a Dutch immigrant named Andreas Cornelius van Kujik, whose honorary title was given to him in 1948 by Governor Jimmie Davis of Louisiana. He was a flamboyant promoter whose pre-Elvis experience included shows called The Great Parker Pony Circus and Tom Parker and His Dancing Turkeys and was a veteran of carnivals, medicine shows and various other entertainment enterprises. Also in 1955, after a suggestion that RCA bid $20,000 to land Elvis Presley, company executive Mitch Miller replies "no singer is worth that much." In 1960, Elvis Presley started a five-week run at #1 on the U.S. singles chart with “It's Now or Never.” It also hit #1 in the U.K. The song, which was based on the Italian song, “O Sole Mio,” gave Presley his first post-Army #1 hit. The record would have international sales of over 20 million and become a personal favorite of The King. In 1964, actor and singer Dean Martin went to #1 on the US singles chart with 'Everybody Loves Somebody', it made No.11 on the UK chart. In 1965, the Beatles set a new world record for the largest attendance at a pop concert when they played in front of 55,600 fans at Shea Stadium in New York City. Sharing the bill with The Beatles; Brenda Holloway, The King Curtis Band, The Young Rascals and Sounds Incorporated. The Beatles were paid $160,000 for the show, the set list: ‘Twist and Shout’, ‘She's a Woman’, ‘I Feel Fine’, ‘Dizzy Miss Lizzie’, ‘Ticket to Ride’, ‘Everybody's Trying to Be My Baby’, ‘Can't Buy Me Love’, ‘Baby's In Black’, ‘Act Naturally’, ‘I Wanna Be Your Man’, ‘A Hard Day's Night’, ‘Help!’, and ‘I'm Down’. Two of the Rolling Stones were among the audience, Mick Jagger and Keith Richard and later that evening; Bob Dylan visited The Beatles at their hotel. 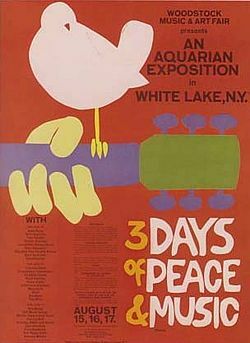 In 1969, the three-day Woodstock Festival kicked-off on Max Yasgur's 600-acre farm in Bethel, New York. Attended by over 400,000 people, the free event featured Jimi Hendrix, Joe Cocker, Crosby, Stills, Nash & Young, Santana, The Who, Creedence Clearwater Revival, Grateful Dead, Janis Joplin, The Band, Canned Heat, Joan Baez, Ten Years After, Sly and the Family Stone, Johnny Winter, Jefferson Airplane, Ravi Shankar, Country Joe and the Fish, Blood, Sweat and Tears, Arlo Guthrie, and Joe Cocker. In 1991, Paul Simon played a free concert for nearly a million people in New York City’s Central Park. In 1992, Jamaican singer-song writer Jackie Edwards died. Edwards worked as a singer, songwriter for Island Records. He wrote both ‘Keep On Running’ and ‘Somebody Help Me’, that became No.1 singles for The Spencer Davis Group as well as releasing his own albums. In 2002, a memorial to John Lennon was unveiled in the remote Scottish village of Durness where Lennon had spent his holidays from age seven to fifteen. The lyrics from 'In My Life' had been inscribed on three stones. In 2007, sixteen solo John Lennon albums were made available to download on iTunes for the first time. A deal was approved by the late Beatle's widow Yoko Ono following a lengthy legal battle between the band's label Apple Corps and Apple Inc, which owned Tunes. In 2007, the Osmond Brothers, joined by siblings Donny, Marie and Jimmy, took the stage for the taping of a 50th anniversary reunion show to be aired on PBS. A meeting of no less than seven singing Osmonds onstage hadn't happened in more than 20 years, although no one could remember the exact date of the last full family concert. In 2008, record producer Jerry Wexler, who influenced the careers of such legends as Aretha Franklin, Ray Charles and Bob Dylan, died at his home in Sarasota, Florida. He was 91. Among Wexler’s production credits are Franklin’s hit “Respect,” Wilson Pickett’s “In the Midnight Hour,” and he helped Bob Dylan win his first Grammy by producing his 1979 album Slow Train Coming. Wexler is also credited with coining the term “rhythm and blues” while writing for Billboard magazine in the late 1940s. In 2010, Robert Wilson, bassist for The Gap Band, passed away at the age of 53. In a career that started in the late '70s, the group had four Platinum albums and fifteen US Top Ten hits, including four that made it to number one.